When I was a very small girl my family lived in Des Moines, Iowa. In fact, we lived there twice, when I was three to six and when I was 14 to 17. My dad was pastor of the Free Methodist church. There was a man in the church who, for some reason, took a liking to me! Bro. Trumbauer. Back then we called folks, in the church, Brother and Sister. I remember, as a very small child, sometimes going home with Bro. and Sis. Trumbauer after church on a Sunday morning and staying all afternoon until the evening service! I remember sitting on his lap while he told stories to me! It’s a wonderful memory. The first time we moved away the WMS (Women’s Missionary Society) made a quilt for my parents. The women embroidered their names on quilt blocks. A few years ago Mother gave the quilt to me. I treasure it. Bro. and Sis. Trumbauer’s name is on the center block along with another woman, whom I also remember. 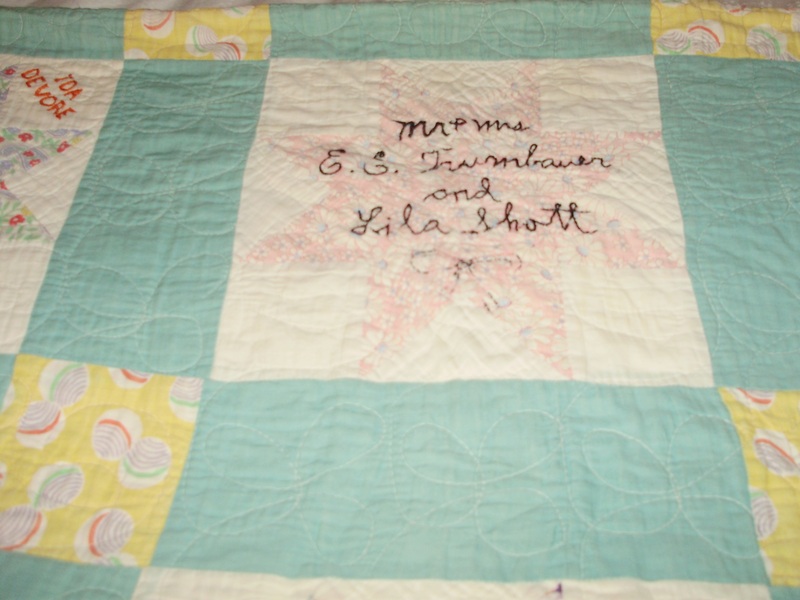 It’s interesting to me how they wrote their name: Mr & Mrs E. E. Trumbauer and Lila Shott. When we moved back and I was a teenager, he was still my friend although I didn’t go home with him any more. Years went by, they both died. One time when my parents came to visit they brought me a gift from Bro. Trumbauer! 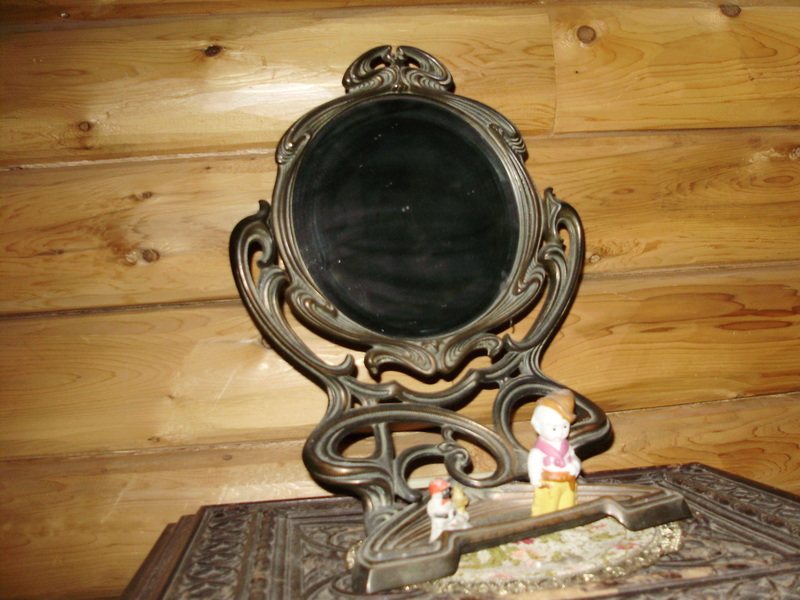 An antique mirror! Mother said he gave the mirror to her with the instruction that it was to be given to me when the time was right! That was about 17 years ago! We had moved into our log home and she felt the time was right! I’m thrilled to have this mirror and to have it as a reminder of my dear friend. He’s been gone for a very long time now. Thank you, Brother Trumbauer! This entry was posted in Antique, Death, Des Moines, Free Methodist Church, Friend, Iowa, Me, Memories, Mirror and tagged Antique, Des Moines, Free Methodist Church, Friend, Iowa, Me, Memories, Mirror. Bookmark the permalink.